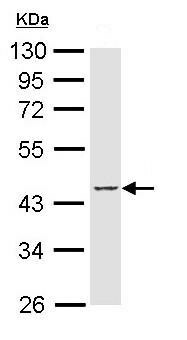 Recombinant fragment, corresponding to a region within amino acids 129-378 of Human PPAR delta. Molt-4 and Mouse brown adipose tissue whole cell lysates; A549 Xenograft tissue. Our Abpromise guarantee covers the use of ab137724 in the following tested applications. WB 1/500 - 1/3000. Predicted molecular weight: 50 kDa. Incubate the sections in 3% H2O2 at room temperature for 30 minutes. Incubate the sections in 1.5% goat serum (dilute goat serum by 1xPBS) at room temperature for 30 minutes. 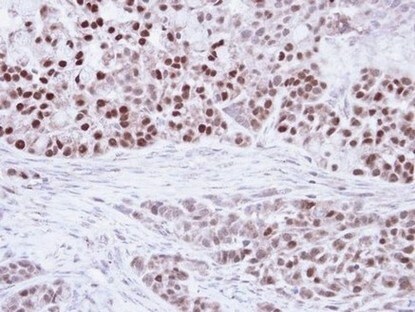 Immunohistochemical analysis of paraffin-embedded A549 xenograft tissue labelling PPAR delta with ab137724 at 1/100 dilution.